I was so impressed with Lan Shui’s Seascapes – see review – that I included it among my picks for 2007. As performances these aquatically linked pieces are remarkable for their refinement and atmosphere, qualities matched by the glorious BIS recording. Indeed, I’d go so far as to say Seascapes is one of the most natural-sounding discs I’ve ever heard. Moreover, Shui’s readings of La Mer and The Sea are up there with the best; in short, a collection to cherish. This new Rachmaninov disc – which marks the Singapore Symphony Orchestra’s 30th anniversary – is a tougher project altogether. Both works are so overexposed that any newcomers need to be pretty special to challenge the best, among them Ashkenazy, Jansons, Previn and Svetlanov. This is especially true of the 60-minute symphony – much cut until Previn’s complete EMI recording in the 1970s – which needs a firm hand if it’s not to outstay its welcome. Happily, the E minor symphony coincides with the composer’s sojourn in Dresden, where he was able to shrug off memories of his disastrous First Symphony and get down to some serious work. Just as happily, the opening motto theme on cellos and string basses makes a marvellous impact here. The strings are silky smooth, the brass well blended, and Shui shapes this twisting, turning music very persuasively indeed. Its thematic material is laid out methodically, but make no mistake this isn’t just about attention to detail. There’s an ebb and flow to the music-making, a sense of the larger structure, which is most welcome. The Singaporeans are a very accomplished band indeed, capable of a full and cultured sound, but there were moments in the Largo-Allegro moderato where I longed for a bit more passion – turmoil even. That said, some listeners might well prefer this more self-effacing approach to that of, say, Svetlanov and Jansons, even if does sell the music short. The unison horns that announce the second movement are a case in point; they sound splendid but perhaps they’re a little too polite for this feisty scherzo. No quibbles about the surge and thrust of the strings, though, which are always deftly articulated. 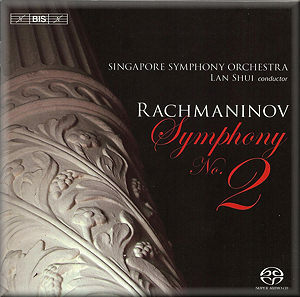 The Adagio contains some of Rachmaninov’s loveliest writing, its inwardness well served by the Singapore band’s inherent glow. The solo clarinets sound particularly lovely, the music’s gentle pulse just audible below those soaring melodies. The recording team certainly captures the detail and dynamics of this performance, but then they are aided by the warm, sympathetic acoustic of Singapore’s Esplanade Concert Hall. It’s not in the same league as Seascapes, also recorded there, but ear-catching nonetheless, especially in the serene glow of the Adagio’s closing bars. The more robust final movement holds no surprises, either; Shui is alert to the music’s broad rhythms and the brass are suitably bracing throughout. It’s in this potentially overblown movement that the conductor’s more controlled approach pays dividends. There is a pleasing sense of scale, the percussion imparting just enough tingle to the proceedings. Although the pace flags at times Shui is quick to tighten the reins and drive the music onwards once more. And whatever one’s other reservations the climax to this symphony is weighty enough. Rachmaninov orchestrated Vocalise, the last of his Fourteen Songs, Op. 34 which, at just under six minutes, makes for a light dessert. Again, the music’s chamber-like intimacy – it always reminds me of Wagner’s Siegfried Idyll – sits well with these thoughtful and committed players. My only caveat, and it’s a big one, is that the performance is short on personality, a criticism that applies to the symphony as well. A pleasant tipple then, but if you like your vodka neat you’ll have to look elsewhere. For all its technical and musical strengths this recording never really catches fire; that’s a pity, as I so wanted to like this disc. Furthermore, I was puzzled by the quality of the stereo SACD layer, which sounds rather diffuse and biased towards the left channel. The CD layer is fine, though, so I can only assume this is a glitch on my review copy.